Okay. It’s obscure, silly and not very good. That can only mean one thing: it’s “Automan“! First aired in December 1983, and with a total of thirteen episodes (of which twelve were broadcast by ABC), Automan was US television’s “inspired-by” version of the hit Sci-Fi movie of the previous year, “Tron”. Though it closely resembled the big screen success in style and look that is pretty much where the similarities ended. The basic premise of the show was the adventures of a police officer and computer-programmer named Walter Nebicher (played by the woefully wooden Desi Arnaz Jr.) who had created an artificially intelligent program that generated a crime-fighting “solid” hologram styled “Automatic Man” (Automan, get it?). The latter character was played by that irredeemably All-American poster boy Chuck Wagner and was able to interact with the real world as a secret U.S. Government agent. Automan’s sidekick was “Cursor”, a floating mote of glowing energy which could generate three-dimensional physical objects when needed, generally cars, helicopters and the like. And if that sounds ridiculous, well it kind of was, the one redeeming feature being that Automan’s autocar (sorry) was a real Lamborghini Countach LP400. Like his Tron inspirations Automan was noticeable for glowing blue in the dark – this to resemble the on-screen special effects surrounding the character and what was perceived as a suitable “computer” colour. 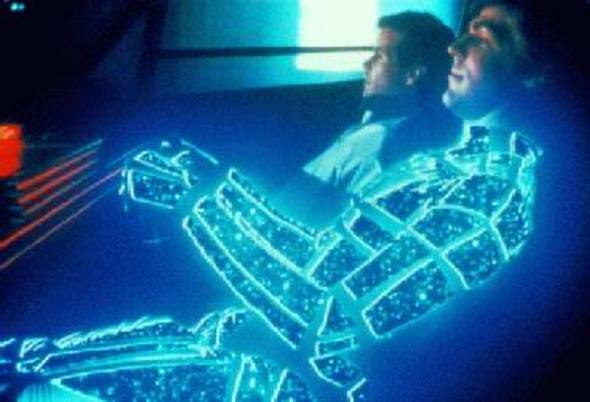 To achieve this the actor’s suit was fitted with reflective tubes and plates upon which projectors were shone (unlike Tron where the “glowing” features were frequently the result of laborious hand-painted film cells). After all that there is little more to say about one of a wave of 1980s’ American crime-fighting “gimmick” shows that came and went with little lasting cultural impact. Most employed the same formulaic storylines, from “Knightrider” (1982-1986) to “Airwolf” (1984-1987), and Automan despite its overtly Science-Fiction overlay was simply more of the same. The stories have dated – as has the acting. The special effects are watchable in a quaint way but there is little enough drama or narrative beyond that to hold anyone’s interest, not even a bit of retro-chic or a “so bad its good” status to hold onto. Perhaps this is why the show remains (so far) unreleased on DVD or Blu-ray – and probably why it never will be.